This title will be auto-delivered to your Kindle on 12 May 2019. Two of her sisters have found their happily-ever-afters, but will the third Farris Triplet open herself up to the possibility of love? Forensic anthropologist Carrie Farris is practical and cynical. 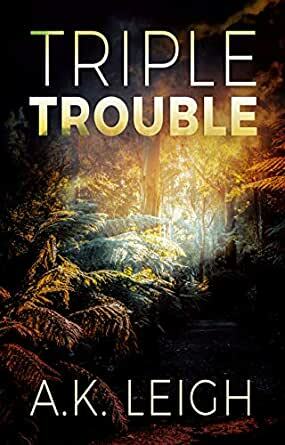 She is content to focus on her thriving career and the cold cases she solves with her identical triplet sisters. Even if she had time for a romantic relationship, she doesn't believe in 'true love'. Not with her track record. Rocco Donati arrives in Cairns searching for an escape from his high-maintenance ex and the pressures of heading his family's forensic technology company. A position at the local forensics lab might be just the thing he needs. Though a romantic relationship is far from his mind, he can't help but be intrigued by his new colleague's passion, cheeky sense of humour, and flirty undertones. As an ongoing murder investigation edges closer to a suspect, Carrie learns to rely on the last person she ever thought she would: a man. But the instant it seems Carrie might get her happily-ever-after, the murderer decides to finish what he started. Will the Farris Triplets pay the ultimate price ... or will they show a killer just how much trouble they can be?